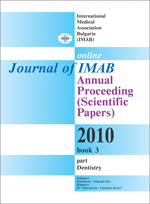 The purpose of this study is to present the traditional and contemporary views on autonomous management of the dental profession in Bulgaria during the period of transition. Methods: The interdependence between the professionalism and ethics was analyzed and the concept of system approach in ethical conduct of the practicing doctor is defined. Results: Dynamic of social relationship shaped by the globalization and European integration and the design of the social contract between the profession and the society are reviewed. Moral, legal and professional issues relevant to current social and economic aspects of health reforms impacts on the reestablishment of professional autonomy in Bulgaria are presented. Professional autonomy is based on self-regulation aiming to keep the collective image and standards but is focused on the professional conduct and behavior of the members. A model of ethical discourse and ethical approach is discussed. Conclusions: Ethics and professionalism are in interdependence in the democratic society. Autonomy, or self-determination, as the core value of dentistry has been reestablished along the reestablishment of democracy in Bulgaria. In the value system of professionals traditional and contemporary virtues form a complex mixture. There is a need for integrity and consensus on formulating the rules of professionalism in dentistry. Professional ethics must be taught and appropriate courses should be part of the dental curriculum and continuing education in dentistry. Key words: ethics, dentistry, professional autonomy, ethical system, professional conduct.